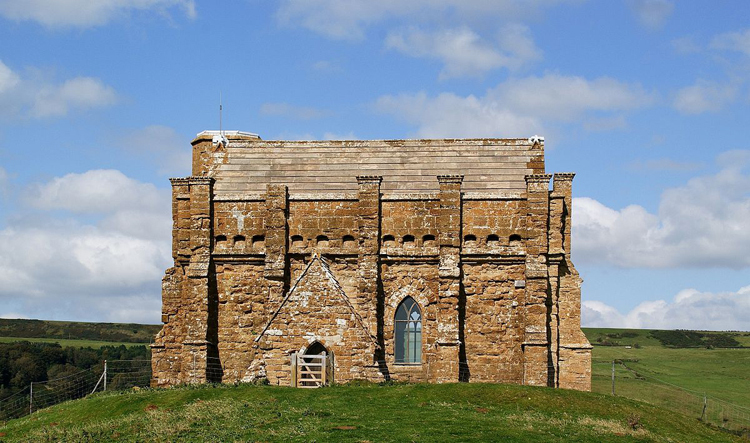 At another amazing location on the south coast in Dorset, St. Catherine’s Chapel stands on a small hill above the village of Abbotsbury. From there one has incredible views of the coast including Chesil Beach. The chapel was built by the monks of the Benedictine Abbotsbury Abbey in the 14th century at the same time as Abbotsbury’s impressive tithe barn. It was dedicated, somewhat unusually, to St. Catherine, the third century saint, who was tortured to death on a wheel and became a patron saint of virgins and is linked to Mount Sinai. The chapel is a rectangle and somewhat unusual in its effect of seeming larger than it actually is. It also has remarkable acoustic qualities. There were only a handful of chapels that were separate from their monasteries and most did not survive the Dissolution in the 16th century. St Catherine’s, however, did survive, perhaps because of its location as a navigation point for shipping? The chapel was repaired in the 18th and 19th centuries but remainslargely unaltered in its simple strength and beauty – clean and bare. It appears in the Powell-Pressburger film ‘The Small Back Room’ (1949)along with Stonehenge, and local singer P J Harvey was inspired to write ‘The Wind’ song on her album ‘Is This Desire’ in 1998, an homage to Catherine listening to the wind blow from the top of her hill. Don’t forget to visit the remarkable Swannery nearby. Directions: The chapel is accessed on foot up a steep incline of approximately 1/2 mile. Parking is available in Abbotsbury town centre off Rodden Row (car park postcode DT3 4JL) a short walk from Chapel Hill.